Actress, Huo Si Yan (霍思燕) attended the store opening of Celine held in Beijing, China on December 9, 2012. The beautiful actress wore a monochrome leather dress from Céline Resort 2013 collection. 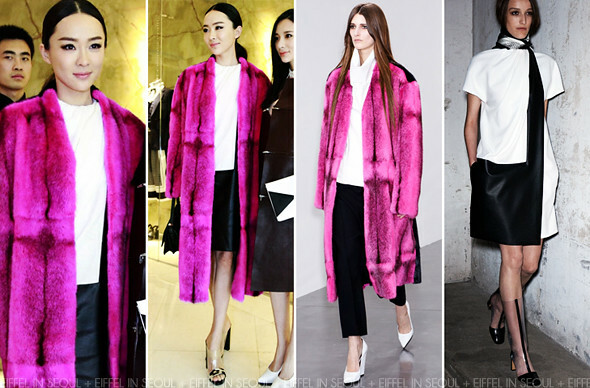 Accessorizing her look with a hot pink fur coat from Fall/Winter 2012 and leopard print PVC sandals. She looked beautiful, ankles up. Those shoes are horrendous. Would love to see her wear a statement necklace.